of our uneasy time. 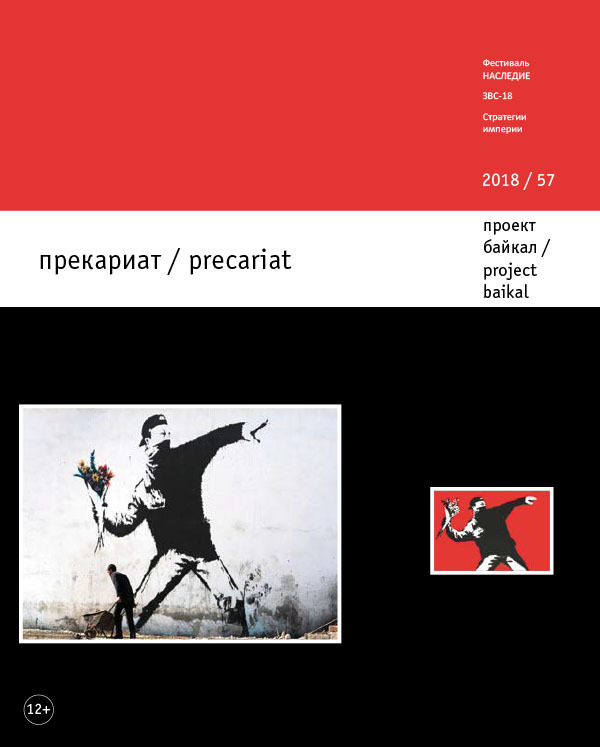 The emergence of a new class called precariats has been identified just recently: this new term was introduced by G. Stending from Great Britain seven years ago. He called the new class currently emerging and bearing a huge devastating potential “precariat” (similar to “proletariat”, from Latin precarium – unreliable, unstable). The tangle of problems united by the term “precariat” includes economics, robotics, sociology and demography. It embraces the problem of migrants flooding rich countries, as well as an ominous question: where to place people who no longer have an opportunity to work in industry or services? The prospects of space development of Russia and the imperial approach. Renovation (reanimation?) of small cities, which found themselves in precarious situation. In Russia, the future gets an additional charge of uncertainty because the strategies of its geopolitical development are ambiguous. Triggered by the challenges of the new millennium, the processes generally called “precariat” are complicated and diverse. We have tried to do a review of opinions and thoughts on this subject expressed by different people – scientists, architectural theoreticians and renowned architectural practitioners. Siberia (such cities as Irkutsk, Angarsk, Bratsk, Chita and Krasnoyarsk, republics of Buryatia, Tyva, Khakassia, as well as Ust-Ordynsky and Aginsky national districts of Buryatia). Since 2007 architects from Western Siberia (Omsk and Barnaul) have also participated in the Festival. The Festival becomes open. Krasnoyarsk housed the Festival for the second time. In 2017, Altai architects proposed to hold the next Festival in Barnaul. We decided to leave the name of the Festival, filling it with a new geographical meaning. And so we present the Festival “Zodchestvo in Siberia 2018”. The Ministry of Economic Development has recently introduced two documents concerning Russia’s prospects – the Strategy of space development of Russia and the Complex plan of modernization of the transport infrastructure. The principal idea of the documents is to concentrate the inhabitants in a small number of agglomerations with the population of each exceeding three million. The documents immediately evoked a strong and mostly negative response among professional communities. The prospects for Siberia and Far East look especially ominous. In this case, what will the Irkutsk region with the population of 2,404,195 (which is still decreasing) look like? What are the inhabitants of small towns offered to do? Will the proposed strategy turn the majority of Russians into the precariat? Or the whole population of Russia is already the precariat? The geopolitical trends in the country are commented upon by two leading experts, Alexander Kuzmin and Andrey Bokov. The uncertainty of geopolitical processes plunge small towns deep into precarity with ambiguous prospects. Will the financial injection into the project “Urban environment in small towns and historic settlements” made by the Federal Ministry of Construction be helpful? At least it won’t hurt. Already the collaboration between citizens and municipalities during the work on the concepts gave impulse to development. We bring to your attention three projects by “Rozhdestvenka” architectural bureau, participants of the competition. The problems of Ostashkov are comprehensible. Suzdal, however, can be hardly categorized as precarious at first sight; the prospects of this diamond of the Golden Ring are clear. It appears that the population of the city is decreasing, the city’s expenses exceed its revenues, and a big flow of tourists deteriorates the city infrastructure. We hope that the competition will become annual, and the regional and city authorities will admit that this work can be a success only with the participation of professional architects. the surrounding cities. The revitalization program for urban centers started last year with research and experimental work. The word “precariat” is derived from the Latin “precarium” (unreliable, unstable). Creative professions have always been insecure, and in the era of the precariat they finally lose all social guarantees. As it is said, anyone can hurt an artist’s feelings. On the other hand, sociologists affirm that the role of the creative class keeps on growing, and the presence of creative professionals is a “growth hormone” necessary for development of cities. think that today’s crisis will bring not only new challenges, but also new opportunities for future generations of architects. Who will prove to be more right? The author shares his impressions on the First Moscow Festival devoted to preservation and restoration of the cultural and historical heritage sites. He makes a conclusion on insufficient methodological comprehension of the subject. Unclear definitions of the cultural heritage site hinder development of this sector and obstruct cooperation of the monument protection agencies with business communities and public organizations. “The Image of the City” by Kevin Lynch gave rise to the environmental approach, which expressed demographic values. In the environmental approach, architecture of a separate structure merged with the city, losing its aristocraticism and transcendental isolation. The word “lynching” is used in wordplay and means a democratic trial of the aristocratic architecture. The environmental approach results in the death of architecture. The article presents the history of formation and development of Barnaul as a mining city from its foundation to the end of the 19th century. It features the establishment and the evolution of copper-smelting and silver-smelting industries as city-forming factors. The article characterizes the activities of mineralogists, merchants, engineers and architects starting from the 17th century. The biographical details of the most famous people are given. The peculiarities of the city’s culture are featured. Antiquity and Hellenism. The article proves that precariatization of the creative class, including architects, produces new challenges and new opportunities for development of the profession. The article is focused on the problem of interrelations between the historical and the geographical rootedness of architecture on the one hand, and, on the other hand, its currently growing unrootedness. The author’s reflections on the roots of architecture and how it is breaking away from those roots evolve into a relevant metadiscourse about the rooted and the unrooted in culture. Throughout the 20th century, citizens have been losing the idea of Home as a constant in life. Depersonalized “housing estates” with a standard set of things are a common lot. But even rich citizens, who have an opportunity to build a house outside the city or to buy a big apartment, get a surrogate instead of a home. Boxlike houses are not harmless. They transform a human to fit themselves, while forming the generations where the “box man” will dominate. The article gives a comprehensive review of the three contemporary town-planning problems: the formation of the settlement framework in the Russian Federation; the cohesion of all parts of the territory of the RF; organization of the living environment. The present-day situation in town planning is analyzed. The author is concerned about this situation and proposes the reasoned strategies for its solution. The article reviews theoretical principles of researching the development strategy for Russia, underlines the significance of the system approach in the theoretical analysis and features the uniqueness of the Russian space. It compares the formation of the Russian social space, its constants and variables with similar processes in European and Non-European countries. The article analyzes the notion of strategy, its characteristics and how it differs from policy. It consistently describes the Russian social space – the space of the country, the space of the regions, the space of life as the levels of social organization of the country. It underlines the importance of the communication framework. situation. The authors offer a brief development of five pilot sites, which will become the future zones of growth, investment into the reconstruction of the center and adaptation to new relevant functions. The author features the evolution of the functions of the central boulevard in Ostashkov. He points out the inadmissibility of the marginalized environment in the center of the city. The author proposes the measures for quality changes in the given urban territory with zoning and capitalization. population is pushed out in the peripheral cities. These cities risk to concentrate an economic and social fragile population, without possessing the necessary financial means to support these households. A metropolitan and even national adjustment between the cities and territories becomes necessary. The following text describes the situation of three cities in the Paris metropolitan area. For the last five thousand years, the significance of architecture has been constantly decreasing. From the ancient cult, architecture first turned into art, then into a stepdaughter and a servant of the power. The contemporary structures express no common cultural mythology of life and the world. They have no proper effect of reference to sociology or philosophy. Hypothetically, it is possible to return to architecture its fundamental functions erased by the centuries-long verbal culture. The Dutch embraced in the 1920s the idea that they could improve society by forcing antisocial families in so-called housing schools. Slums were cleared under the pre-text of urban renewal, and vulnerable families were put under supervision in special projects that became known as “Woonschool”. This government interference into the lives of citizens resulted after WWII into the deportation of two thousand people from the larger Dutch cities to remote provinces to be trained in becoming decent citizens, starting with the forced removal of victims of the German bombardment of Rotterdam. Shifting opinions on what deviant social behaviour is and what the role of the government should be in society gradually eroded the support for housing school practices in the late 1950s, early 1960s. The fact that the approach hasn’t been successful did help. However, a new generation of populist politicians was able to breathe new life into this old concept: smaller in scale than previously and now marketed under the Danish name “Skaeve Huse”. Once more, cities test the boundaries how far the government can go with intervening in the lives of individuals for the benefit for society.